Victoria is Australia's smallest mainland state in terms of area, but is the second largest in population. Situated in south-eastern Australia, Victoria covers 237,629 sq km. To its north, beyond the Murray River is New South Wales, to its west is South Australia and to the south - across Bass Strait - lies Tasmania. The capital city in Victoria is Melbourne, often winner of the world's most liveable city title, and home to more than 4 million people. 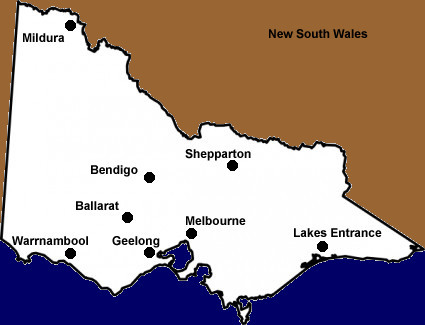 Melbourne has two thirds of Victoria's population within its metropolitan area. Victoria has a moderate climate and its weather is very changeable. Four seasons in one day so when out and about you should plan for all contingencies. In the peak of summer the temperatures can hit 45C, while in winter it can be around 10C - although the wind chill factor coming from off Antarctica can make it seem much colder. Being a compact state it is easy to tour around Victoria. The state offers beautiful scenery from the Great Ocean Road from Geelong to Warrnambool in the south-west, the old goldfields around Ballarat and Bendigo, the wine country of the Yarra Valley and in the central and northern areas, snow skiing in the alps and the mighty Murray River. Melbourne is arguably the world's sporting capital and its residents flock to major sports events. The most popular is Australian Rules Football, better known as The Footy, and 70 to 80,000 fans attend club matches at the Melbourne Cricket Ground. In summer the MCG hosts cricket, Australia's national sport, and of course there is the Australian Open in tennis at the nearby Melbourne Park complex. The city is also famed for its restaurants and you can dine out and enjoy almost any cuisine or style of cooking from around the world. Victoria has a strong political and economic rivalry with its northern neighbour New South Wales, and a great sorting rivalry with South Australia. In the years the Australian capital Canberra was being designed and built, Melbourne was the acting-capital of the country.